The commissions/incentives should only be paid out on the retail of product/s. 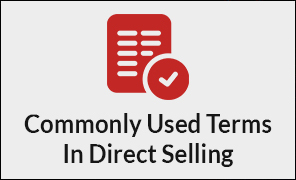 The direct seller should have the opportunity to earn by retailing of products even though he may not have introduced any direct sellers in his/her tree structure/marketing organization. There should be no compulsion or the minimum purchase criteria to activate and start earning income from the compensation plan. In other words, there should be no compulsion on the direct seller to buy products of a particular sum after or during enrolment. However, the direct seller should -purchase for self-consumption and/or retail to meet the criteria as per the eligibility conditions defined in the compensation plan to qualify for an income. No commissions/incentives or rewards should be given/offered to the direct sellers for enrolment of new direct sellers. Payment of Incentives/Commission - The payment of commissions/incentives should be made without fail and delay as per the commitments of the compensation plan followed by the company. Calculations for all the illustrations used for explaining the compensation plan (online and offline) should be done and shown in Indian rupees only. Equal Opportunity - The company should follow a single ID per individual policy and not promote and/or offer multiple IDs to people while not encouraging direct sellers to offer/provide power legs/existing network of direct sellers or additional incentives to prospects or other direct sellers. The company should also not offer additional incentives other than those mentioned in the compensation plan. The promotions launched by the company in public domain from time to time is however allowed. The company should not provide commitments of returns on investment/s (on purchase of product/s or without the purchase of product/s) in the form of interest, salary, loan, help, donation, market development fees and support fund to/through the direct sellers, to any individual/s. The company should not generate or pay-out or commit commissions/incentives against part payment or advance received against the sale or future commitment to sell any product/s. The company should not deduct any charges (except Tax deducted at source) from pay-outs of the direct sellers. TDS @ 10% in case of availability of the PAN details of the direct sellers. Income/opportunity disclaimer to be the part of the compensation plan literature and should be displayed prominently before or after the presentation of the compensation plan every time.